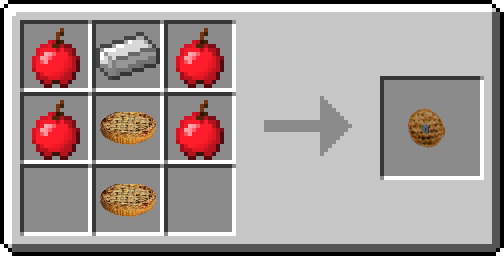 Enjoying Shields in Minecraft? ...Of course. Want NEW Shields with Configurable Durability? ...Yup. Want NEW Shields with Auto repair? ...That would be Awesome. Want NEW Shields with RF Durability? ...Yes please. 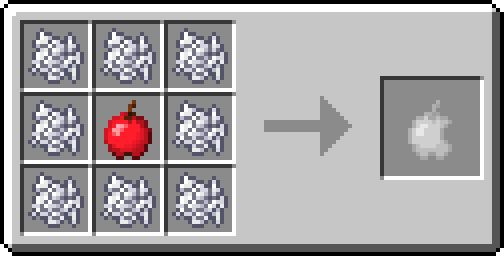 Want NEW Shields made from Apples? ...Wait, what!? have been working on adding some custom shields. This mod is a product of that research with a twist. All the shields have configuration options for their various settings. Modpack use permissions are freely given, all I ask for is a link back to this page if possible. Can be consumed. Has the same stats as an Apple. Used in crafting the iShield (Non RF). Used in crafting the Shield RF. Can be consumed. Has the same stats as a Pumpkin Pie. 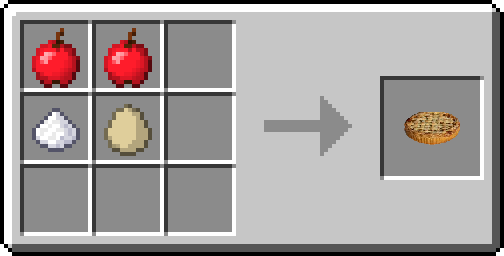 Used in crafting the Apple Pie Shield. 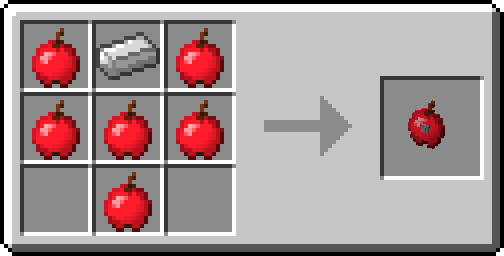 Minecraft's standard apple as a shield. Has a default durability of 336. Can be repaired in an anvil with apples. 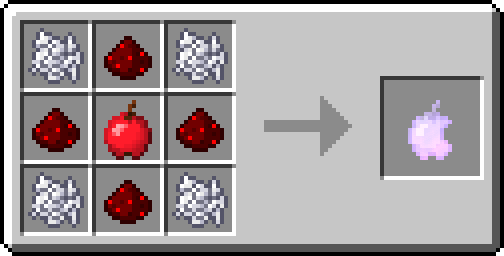 Can be repaired in an anvil with redstone dust. Has a default durability of 504.
every 10 seconds, at the cost of 4 durability per hunger point restored. Can be repaired in an anvil with apple pies. Automatically repairs itself a default of 1 durability every 8 seconds. Can be repaired in an anvil with gold ingots. 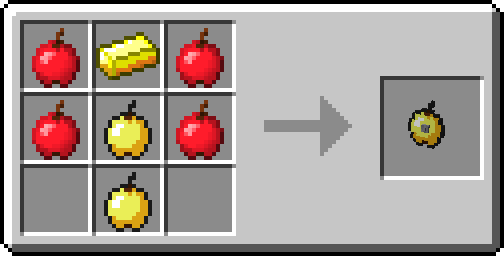 Crafted with enchanted golden apples. Has a default durability of 672. Automatically repairs itself a default of 1 durability every 4 seconds. Can be repaired in an anvil with blocks of gold. Crafted with RF white apples. Has a default RF storage of 10000. Consumes by default 20 RF per damage point to the shield. Can be charged in any RF item charger*. Can be repaired in an anvil with blocks of redstone. I have pulled all versions of the mod apart from the original. This is due to errors that have been found in all the other versions. The iShield (RF version is) causing a crash before fully loading on versions other than the earliest for 1.9.4/1.10.2. Where do you want the crash report? I'm not sure but this might not apply if using another RF mod. Sorry about that - the mod has had some major re-writes over the past week. Sorry for the problems that people have been experiencing recently - as I have said the mod has been completely re-coded and a little lack of focus has caused a few problems. Do you have no Issue tracker? Sorry about that, the mod has been completely re-coded and it looks like something silly was overlooked. We will try and push out a hot fix as soon as possible and correct this. Thanks for the bug report - it really helps. If you still need the mod, I would suggest using the earlier version as it is 100% compatible with the new version - it just has some weird rendering issues with leaf blocks on fancy mode. *Edit, I have removed the latest download due to this bug. In 1.10.2, I've just spent a couple of fun hours pulling mods off and putting them back on my build to find what was making all the tree leaf blocks flicker endlessly once I used any kind of Nightvision. Finally pinned it down to this mod. It appears to be some kind of lighting issue, but have no clue why your mod which ought to add nothing but a couple of items should cause this kind of issue. As a final test ran it with nothing but this mod and Forge 2014 and 2043 and confirmed that it definitely is this mod. Thanks for the report, I'll look in to it right away. It is a strange and specific thing to happen. I'll see if I can replicate it and find out if the rendering code is causing it. It's most likely to do with the rendering rather than any lighting tbh. 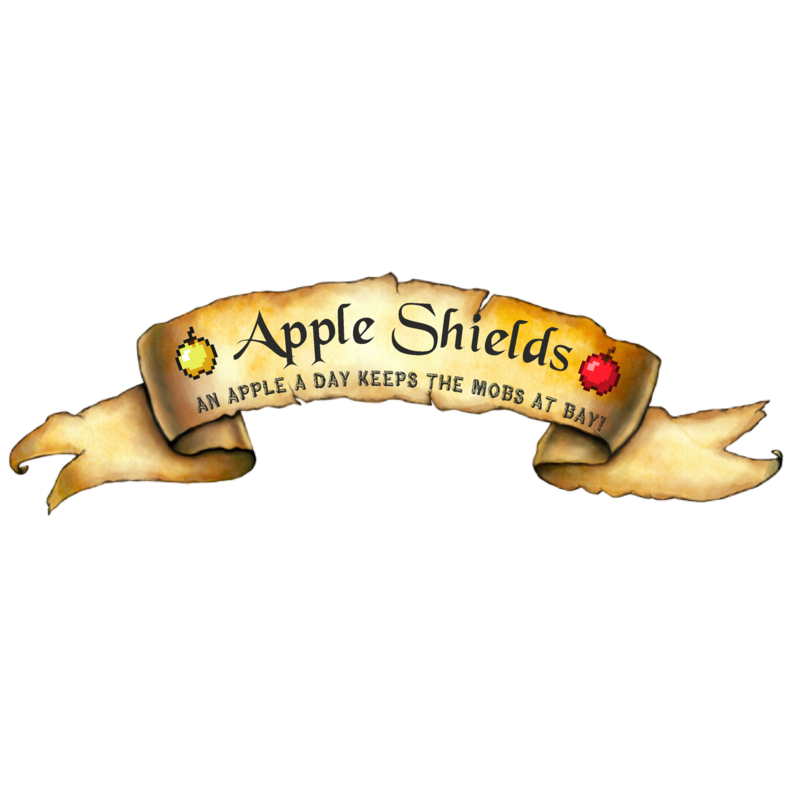 Holding an apple for a shield is cool and aw, but its feels weird to me holding a very flat apple as a shield. I would imagine that it would be a giant apple that is cut in half with a giant staple that is attach to the back. 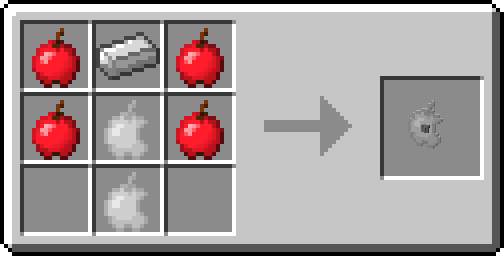 And because a normal apple in real life is thick, it can stop maybe a few things. But not as affective as eating it. But as for the golden and icon apple shields, they do make some since do to their material being made of iron and gold. But other then that, this mod is great if I were in need of more shields. Cool, I hope you enjoy the mod.